There are numerous causes of ear pain. While there are many causes of ear pain, identifying the other associated symptoms may help you narrow down the cause of your pain. Otitis media is the medical term for a middle ear infection. The condition can cause significant ear pain which may get worse when lying down. Otitis media occurs when the auditory tube becomes blocked and is unable to drain. This may occur following a cold or congestion caused by allergies. Otitis media is more common in children because of the size and angle of their auditory tube but can also occur in adults. Other symptoms of otitis media may include fever, nausea and vomiting, loss of balance, or in severe cases, drainage from the ear. Small children who are unable to talk may become irritable and may touch or pull at their ears. Mastoiditis is an uncommon condition that occurs when a middle ear infection spreads to the mastoid bone. In addition to the symptoms of a middle ear infection symptoms of mastoiditis include: redness or swelling behind the ear, headaches, and if the infection progresses long enough abscesses in the neck. Foreign objects in the ear commonly occurs in children. When the object becomes stuck in the ear, pain can occur. If an object is pushed too far inside of the ear it can actually rupture the eardrum. Auditory tube dysfunction is the abnormal opening or closing of the auditory tube. Under normal circumstances, the auditory tube opens and closes in response to changes in atmospheric pressure. This allows the air inside of the middle ear to equalize. Any condition that causes the auditory tube to become clogged or prevents it from opening and closing can be referred to as auditory tube dysfunction. This can result in pressure and pain in the ear when the atmospheric pressure changes rapidly and the pressure in the middle ear is unable to equalize. Examples of situations that might cause this are taking off or landing in an airplane, scuba diving, or driving up a steep mountain. In some cases, you may experience ear pain for a moment which then subsides as the pressure in the middle ear stabilizes. In severe cases, pressure in the middle ear becomes too great and the eardrum may rupture. This is called barotrauma of the ear. Ruptured ear drums can cause severe pain initially, however, the pain may quickly subside after the rupture. The most common cause of a ruptured ear drum is barotrauma due to auditory tube dysfunction and atmospheric pressure changes. However, a ruptured ear drum can also be caused by extremely loud noises or trauma when foreign objects such as bobby pins or Q-tips are inserted into the ear. 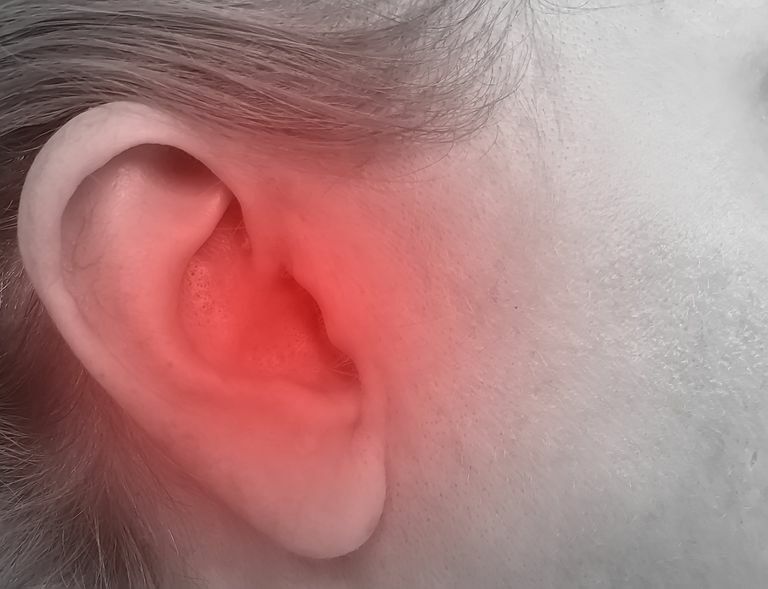 Besides pain that may last only a short period of time, other symptoms of a ruptured eardrum include sudden hearing loss, dizziness, and drainage from the ear which may be bloody. Otitis externa is the medical term for swimmer's ear. Swimmer's ear is an infection of the outer ear caused by contaminated water. It is common among swimmers but can also occur when the ears do not completely dry out after baths or showers. Swimmer's ear occurs in both children and adults and in addition to ear pain can result in ear redness, itchy ears, dry flaky skin, drainage from the ear, and fevers. Ear trauma refers to any kind of injury to the outer portion of the ear. This type of injury can commonly occur in certain contact sports such as mixed martial arts, but the risk is reduced if headgear is worn. If an injury becomes infected it can lead to perichondritis.